Yessssss I have been looking forward to this book for years! Finally it’s here, it’s massive and then I started reading and I didn’t want it to end! 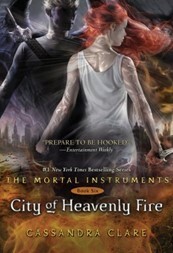 But I have done it and below you can find my review on City of Heavenly Fire – Cassandra Clare. As always I would recommend you start reading this series, The Mortal Instruments, from the start with book 1 – City of Bones.